Our refurbished products are products that have not been used or have been used and returned to us in a very good condition. They have been the subject of numerous tests and are therefore in perfect working order and still under warranty. 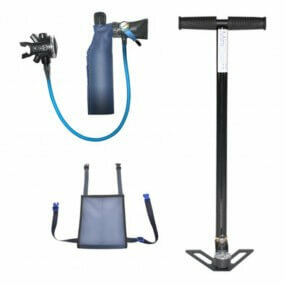 The M3S hand pump allows you to fill yourself your own MiniDive Pro (0.5 L) or tank (0.5 L). The maximal service pressure is 200 bar (3000 psi) and the pumping time is 15 mins average. The basic pack ! 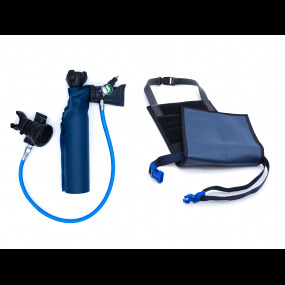 This pack includes the MiniDive Pro (0.5 L) that has up to 10 mins autonomy with its high quality harness that give you the hands free underwater. The MiniDive Pro can be filled by: a dive compressor, a DIN or Yoke filling station, a high pressure hand pump or the MiniDive mini electric compressor. The simple pack ! 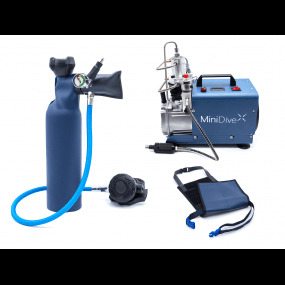 This pack includes the MiniDive Pro (0.5 L) that has up to 10 mins autonomy. 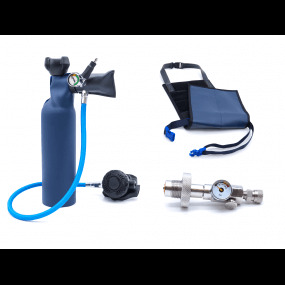 Its filling will be very quick and easy with the DIN filling station included, as much as the high quality harness that give you the hands free underwater. This pack is the best if you have a big diving tank. The simple pack ! This pack includes the MiniDive Pro (0.5 L) that has up to 10 mins autonomy. Its filling will be very quick and easy with the Yoke filling station included, as much as the high quality harness that give you the hands free underwater. This pack is the best if you have a big diving tank. The basic pack ! 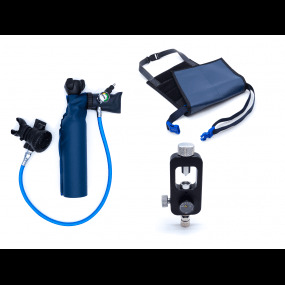 This pack includes the MiniDive Pro+ (0.8 L) that has up to 15 mins autonomy with its high quality harness that give you the hands free underwater. 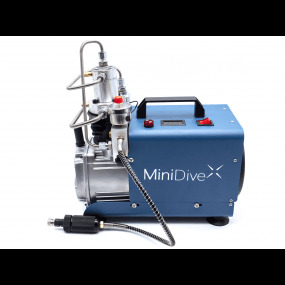 The MiniDive Pro+ can be filled by: a dive compressor, a DIN or Yoke filling station, a high pressure hand pump or the MiniDive mini electric compressor. The simple pack ! This pack includes the MiniDive Pro+ (0.8 L) that has up to 15 mins autonomy. Its filling will be very quick and easy with the DIN filling station included, as much as the high quality harness that give you the hands free underwater. This pack is the best if you have a big diving tank. The simple pack ! This pack includes the MiniDive Pro+ (0.8 L) that has up to 15 mins autonomy. Its filling will be very quick and easy with the Yoke filling station included, as much as the high quality harness that give you the hands free underwater. This pack is the best if you have a big diving tank. The starter pack ! 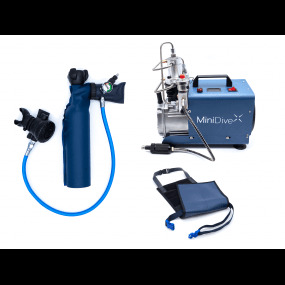 This pack includes the MiniDive Pro (0.5 L) that has up to 10 mins autonomy. 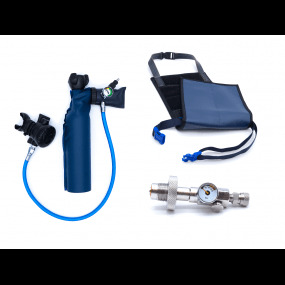 You will fill your tanks very simply with the M3S Hand pump included, as much as the high quality harness that give you the hands free underwater. This pack is the best to start to dive while being autonomous to fill its own tank. You frequently use your MiniDive Pro (0.5 L) or Pro+ (0.8 L) or wish a fast recharging and effortlessly ? Get the mini electric compressor ! One button is enough to completely fill your MiniDive. The more convenient starter pack ! 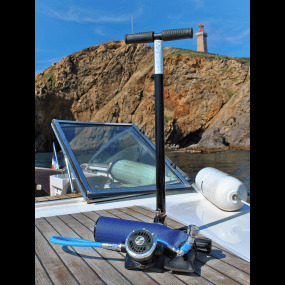 This pack includes the MiniDive Pro (0.5 L) that has up to 10 mins autonomy. 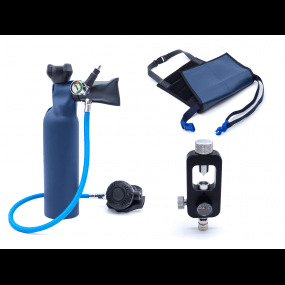 You will fill your tanks very quickly with the mini compressor included, as much as the high quality harness that give you the hands free underwater. This cool pack is the best for a frequency use of the MiniDive Pro (0.5 L). The pleasure pack ! This pack includes the MiniDive Pro+ (0.8 L) that has up to 15 mins autonomy. 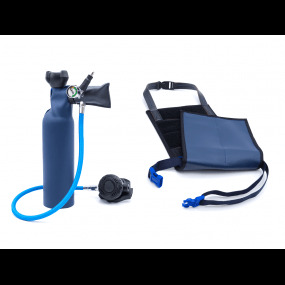 You will fill your tanks very quickly with the mini compressor included, as much as the high quality harness that give you the hands free underwater. This cool pack is the best for a frequency use of the MiniDive Pro+ (0.8 L).